Home › SPORTS › SWC Conference › Back-to-back SWC champs! Senior point guard Cade Rohrbach had 13 points, eight assists and five rebounds in Platteville’s 63–39 win over Lancaster Thursday night. POSTED February 27, 2019 12:40 p.m.
PLATTEVILLE – Platteville’s challenging, weather-interrupted 2018–19 regular season culminated Thursday with a Senior Night celebration for the program’s second-straight Southwest Wisconsin Conference title. 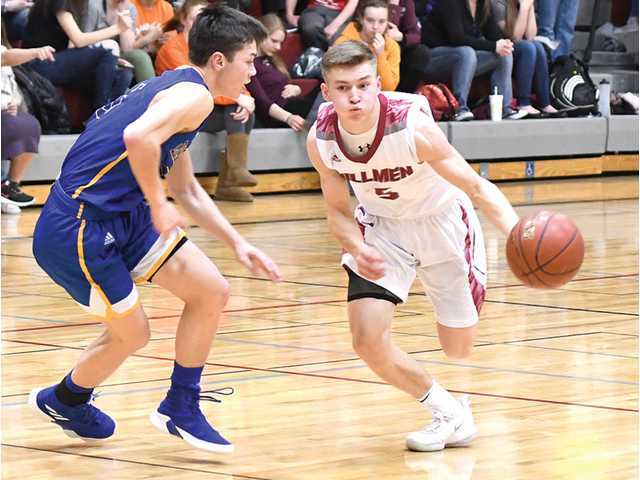 Senior Isaiah Oswald had the hot hand early and finished with a game-high 15 points, while classmate Cade Rohrbach added 13 points, eight assists and five rebounds to lead the Hillmen to a dominating 63–39 victory over visiting Lancaster. Platteville finished the regular season 15–5 overall and 9–1 in the SWC to share this year’s league title with Prairie du Chien (18–3, 9–1). The two teams split their two regular season meetings this year and could possibly meet for Round 3 in a D3 sectional semifinal on Thursday, March 7. But first, the Hillmen and head coach Mike Huser took a moment to celebrate the Platteville boys’ first back-to-back conference titles since 1985 and 1986. Last year’s league title was the program’s first since 1997. “To be able to win back-to-back championships is really quite an accomplishment,” said Huser. “It is a credit to these young men for staying focused when there was a target on their back all season. Every night we got our opponents best effort and our guys were able to rise the occasion. The process of defending the conference started during the summer with all the time the guys put in, but they still had to perform during the season and they did just that this season during the SWC portion of the schedule. Lancaster’s Hayden Wagner scored the game’s first basket, then added another bucket in the lane a minute later to make it 4–2 Lancaster. The rest of the game was all Platteville. Rohrbach hit a pair of free throws on the ensuing possession. Senior Connor Riley score din the paint next trip down and after a steal, Oswald buried a 3-pointer to ignite a 18–4 Platteville run that made it 20–8. Senior Brandon Wiegel scored back-to-back baskets late in the half, Rohrbach split a pair of free throws and senior Osaze King’s putback of a Rohrback miss with 4.2 seconds left in the half sent the Hillmen to intermission with a commanding 39–19 lead. Platteville’s lead ballooned to as many as 33 points at 61–28 with 7:23 lead on three straight baskets by Wiegel, Oswald (3-pointer) and Rohrbach before Huser called off the dogs and emptied the bench. Riley finished with eight points and six rebounds. Fellow senior Trey Bartels added seven points and five rebounds. Platteville earned the #2 seed in its half-sectional of the WIAA Division 3 playoffs and had a first-round bye Tuesday night. The Hillmen will host either Marshall (13–8) or Dodgeville (4–17) in a D3 regional semifinal Friday night at 7 p.m.
With a win Friday night, Platteville would advance to host a regional final Saturday night. Third-seeded Beloit Turner (14–7) is the highest seeded team on the other side of the regional bracket. The Hillmen were scheduled to face Beloit Turner on Feb. 12, but the game was cancelled due to weather. Lancaster (6–15, 2–8) — Cole Kreul 2, Hayden Knapp 3, Dawson Bowen 13, Aaron Murphy 4, Connor Gates 1, Preston Nothe 3, Cole Raisbeck 2, Jackson Uppena 3, Ryan Gallinger 4, Hayden Wagner 4. Totals – 14 9-16 39. Platteville (15–5, 9–1) — Andy Eggers 6, Austin Wein 2, Cade Rohrbach 13, Nathan Busch 2, Isaiah Oswald 15, Brandon Weigel 6, Austin Shaffer 2, Connor Riley 8, Trey Bartels 7, Osaze King 2. Totals – 25-59 8-17 63. 3-point goals — L: 2 (Noethe 1, Uppena 1), P: 5 (Eggers 2, Rohrbach 1, Oswald 2). Total fouls – L: 15, P: 12. Fouled out – none.